Israeli soldiers invaded, Friday, Kufur Qaddoum town, east of the northern West Bank city of Qalqilia, and attacked protesters against the Annexation Wall and colonies, wounding two. 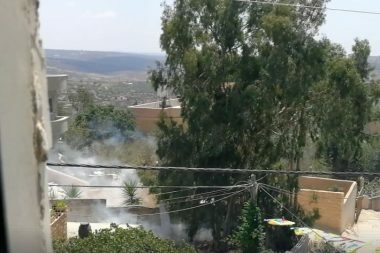 Morad Eshteiwi, the media coordinator of the Popular Committee against the Wall and Colonies in Kufur Qaddoum, said dozens of soldiers invaded the town, and resorted to the excessive use of force against the protesters, by firing live rounds and gas bombs. He added that several youngsters hurled stones at the soldiers, while the army fired many live rounds, rubber-coated steel bullets, gas bombs and concussion grenades. Two Palestinians were shot with rubber-coated steel bullets, and several others suffered the effects of teargas inhalation, especially when the soldiers fired gas bombs directly at a number of homes. Kufur Qaddoum witnesses frequent Israeli military invasions, especially predawn incursions and violent searches of homes, in addition to the abduction of many youngsters by the soldiers. The Israeli army has been escalating its assaults and violations in the village in an attempt to step the ongoing weekly processions.